The RSV4 is a World Champion Again! Lorenzo Savadori and Aprilia lift the 2015 SSTK World Title thanks to the RSV4 RF! Magny-Cours (France), October 4, 2015 - This year, the RSV4 reiterates its pedigree of winning, even in SuperStock's limited mods allowed configuration. The last race of the Superstock 1000 FIM Cup gave Aprilia and Lorenzo Savadori a deserved championship victory after four first places and three podium finishes in eight events. The Aprilia "Team New M2" racer put on a cold and controlled race, avoiding unnecessary risks on a treacherous (semi wet) track and earning the championship by finishing the season 22 points ahead of his nearest rival. Thanks to the second place obtained today by Kevin Calia, Aprilia dominates among brands taking the Constructors' Title with 176 points: 34 ahead of BMW, with Ducati, Yamaha and Kawasaki rounding out the order. Lorenzo Salvadori: "Today I was focused exclusively on the objective. My tactic in the race was to try and get a good start to make strong the first few laps and try to shed the group. Halfway through the race I had decided that I would have to settle for a smart position. I'm really excited in being able to bring home this result that rewards the team, Aprilia Racing, all my sponsors and the mobile clinic of the great efforts they have made. I want to thank all of you very warmly. Thank you so much to all the people who supported me in this important season!" Kevin Calia: "It was a very fun race especially overtaking at the last corner of Raffaele, I also jumped the curb, it was fun and a bit risky but it was the last chance and I wanted to try it all costs. I am very happy with the final part of the season, since my results all year have steadily improved. Next year I hope to stay here with Aprilia and Team New M2 Racing to try to build on the foundation of what we have learned. I would like to thank New M2 Racing Team, Aprilia Racing, my sponsors and all my friends who follow me from home. " Aprilia RSV4 RF racer Alessandro Andreozzi also had an excellent performance. Despite late race trouble with his previously injured arm, he was able to battle bravely with Tamburini helping teammate Salvadori. Alessandro Andreozzi: "I did not start very well but luckily I managed to have a good race pace. The end of the race I had a problem with my arm and I could not force a finishing position ahead of Tamburini but I did manage to keep him behind me some laps. The team has really done a great job. I thank my team, Aprilia Racing and my sponsors who help me. " Race To The Future! | Friday, April 10 presented by Aprilia, AF1 Racing, & REV'IT! Presented by Aprilia, AF1 Racing, & REV'IT! On Friday, April 10, from 7-10P, come party with Aprilia, AF1 Racing, and REV'IT! as we look towards the future of Aprilia! We've got a lot in store for this evening – kicking off the third annual GP of the Americas in style. Meet 125GP champion, Aprilia & REV'IT! rider Alvaro Bautista! The #19 Aprilia rider will be joining us to kick off the weekend and Aprilia's RS GP project as it returns to US soil. See the new 2016 RSV4 RF & Tuono 1100 Factory up close and in person. Aprilia will be on hand to discuss these future Superbike debutants – sure to be two of the hottest bikes for years to come! We'll have light fare (food) and spirits (beer, soda, water) for your enjoyment, customer Aprilia race bikes, and free motorcycle parking. We look forward to seeing everyone again – and cannot wait! Aprilia are 2014 WSBK World Champions! 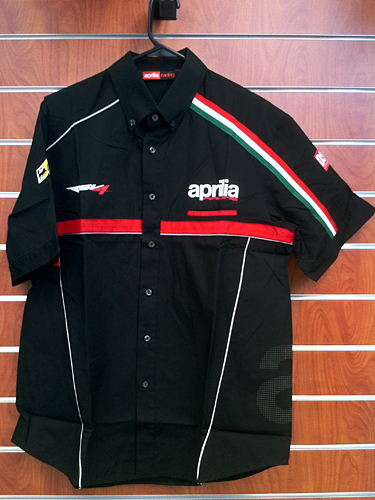 With the 2nd confirmed World Superbike Championship for Aprilia and the no longer quite so "Mad" Max Biaggi, we figured it would be a good idea to scoop up the last of the Official Aprilia WSBK Gear.